Clean, classic and truly synonymous with the engagement ring, it is hard to surpass the sparkle and breathtaking beauty of a round brilliant cut diamond solitaire ring. Simply set with four claws of a cross-over design, this solitaire is completed by a plain, polished band. For those wishing to surprise their partners and unsure of what they might like, one could hardly go wrong with this timeless style. At Voltaire Diamonds, we would be delighted to assist you in finding the perfect ring for you. 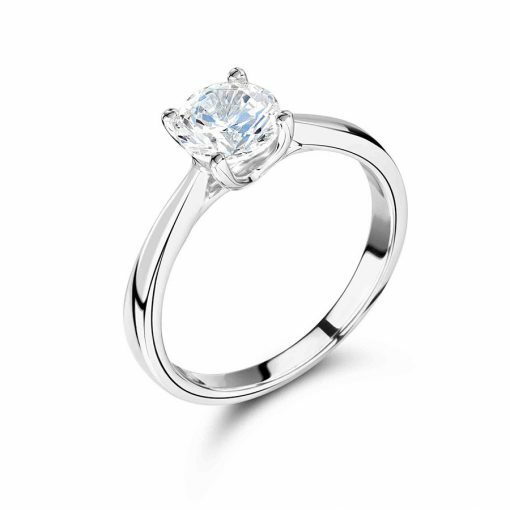 With a comprehensive selection of engagement ring styles and loose stones to choose from, we are happy to take you through each shape and style so that you can find or perhaps even create your dream engagement ring. Our relaxed and comfortable offices are located just off Grafton Street in Dublin and in Hatton Garden in London. Our consultants will be at hand to assist you and show you our full range.